Professor Klaus V Toyka, Department of Neurology, Julius-Maximilians-University, Josef-Schneider-Strasse 11, D-97080 Würzburg, Germany. Telephone (+) 931-201-5751; fax (+) 931-201-3546. EMG recordings from a 14 month old mouse homozygously deficient for the expression of the peripheral myelin protein PMP22. The mouse was anaesthetised with Hypnorm (Janssen, Beerse, Belgium) and investigated using a Tönnies electromyograph with a concentric needle electrode (Medelec DFC25, 0.3 mm diameter, recording area 0.019 mm2). (A) Multiplet discharges in the small foot muscles. 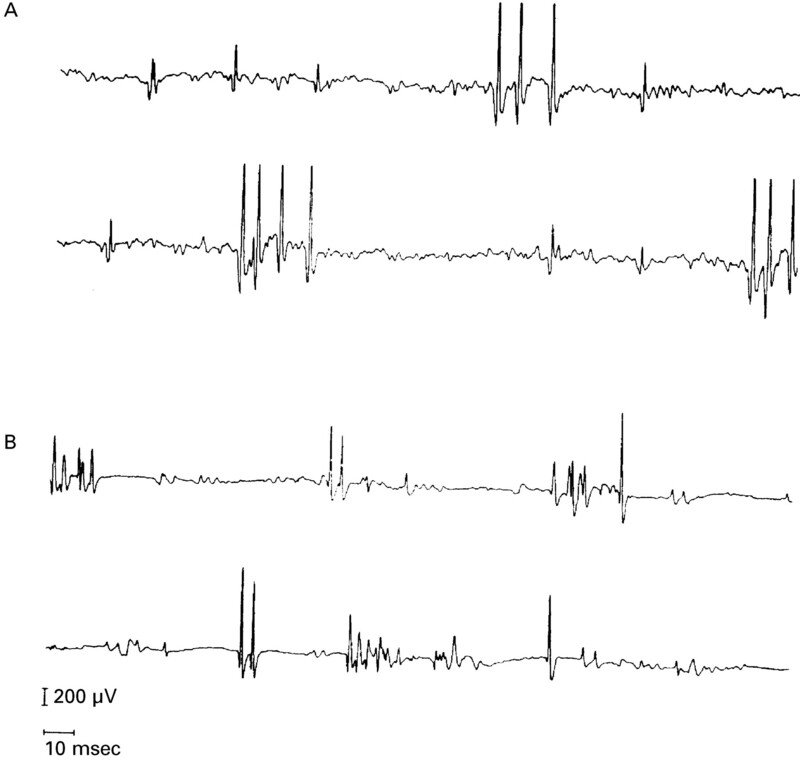 (B) Representative recording of myokymic discharges and doublets from another mouse (PMP22 -/-). There was abundant myokymic motor activity, but no voluntary limb movements during these recordings. Neuromyotonia is characterised by increased muscle stiffness caused by hyperactivity of motor units. Clinical characteristics are increased stiffness and cramping on intended muscle contraction, slowed relaxation, and myokymia.1 2 Neuromyotonia is a heterogeneous condition.3 In the acquired form, autoimmunity against peripheral nerves seems to play a pathogenic part. Neuromyotonia may occasionally follow immune mediated polyneuropathy.4 Antibodies against voltage gated potassium channels have been detected in some cases.5 In the hereditary forms, neuromyotonia may occur in isolation6-8 or in association with hereditary neuropathies.3 9 10 We here report on neuromyotonia developing in aged mice homozygously deficient for or carrying an increased gene dosage of PMP22. Null mutants display a severe dysmyelinating neuropathy characterised by tomacula formation and subsequent myelin degeneration resembling human hereditary neuropathy with pressure palsies (HNPP).11 Nerve conduction studies show a profound slowing11 and repetitive compound muscle action potentials (CMAPs). Despite these profound peripheral nerve abnormalities, mice did not show overactivity up to 12 months. Between the ages of 12 and 14 months, we found progressive overactivity with tonic stretching of the hind limbs and increased cramping of the small foot muscles augmented on voluntary contraction, and generalised myokymia including the whisker muscles in all three PMP22 deficient mice examined. These signs persisted during general anaesthesia. On needle EMG, we found serial high frequency bursts of motor units in the gastrocnemius, quadriceps, and small foot muscles (figure, A). Some of the discharges were doublets, triplets, or multiplets (figure, A and B). In addition, we found continuous myokymic muscle fibre activity (figure, B). Sciatic nerve transsection at the sciatic notch did not abolish the overactivity indicating a peripheral nerve generator. In five 14-18 month old mice heterozygously deficient for the expression of PMP22 and with the typical electrophysiological signs of a dysmyelinating neuropathy, we found neuromyotonia only in one out of three animals at a single site in the gastrocnemius muscle. We also found severe neuromyotonia in a transgenic mouse model with an increased PMP22 gene dosage at one year of age (data not shown). These overexpressing mice have a severe hypomyelinating neuropathy in which Schwann cell development is arrested in a hyperproliferative and premyelination-like state.12 This suggests that the occurence of neuromyotonia is linked to the PMP22 gene dosage. We did not find abnormal nerve conduction, repetitive CMAP or neuromyotonia in four 13 month old control mice with normal PMP22 expression. This is the first demonstration of neuromyotonia in a genetically engineered animal model of a hereditary neuropathy with a defined gene defect. Our finding may eventually help to define the pathogenesis and mode of treatment of hereditary forms of human neuromyotonia. US was supported by a grant from the Swiss National Science Foundation and KVT and JZ by University funds. (1961) A syndrome of continuous muscle-fibre activity. J Neurol Neurosurg Psychiatry 24:319–325. (1965) Neuromyotonie. Klin Wochenschr 43:917–925. (1994) AAEM minimonograph No 44: diseases associated with excess motor unit activity. Muscle Nerve 17:1250–1263. (1984) Muscle hypertrophy and a syndrome of continuous motor unit activity in prednisone-responsive Guillain-Barré polyneuropathy. J Neurol 231:276–279. (1995) Acquired neuromyotonia: evidence for autoantibodies against K+ channels of peripheral nerves. Ann Neurol 38:714–722. (1984) Hereditary form of sustained muscle activity of peripheral nerve origin causing generalized myokymia and muscle stiffness. Ann Neurol 15:13–21. (1984) Hereditary continuous muscle fiber activity. Arch Neurol 41:395–396. (1978) Hyperexcitability of motor and sensory neurons in neuromyotonia. Ann Neurol 5:523–532. (1984) Neuronal type of Charcot-Marie-Tooth disease with a syndrome of continuous motor unit activity. J Neurol Sci 63:11–25. (1991) Neuromyotonia in hereditary motor neuropathy. J Neurol Neurosurg Psychiatry 54:230–235. (1995) Hypermyelination and demyelinating peripheral neuropathy in PMP22-deficient mice. Nat Genet 11:274–280. (1996) Impaired differentiation of Schwann cells in transgenic mice with increased PMP22 gene dosage. J Neurosci 16:5351–5360.